INDIANAPOLIS — Another museum opens another sculpture park. Ho-hum. Isn't that so last decade? Yes, it is. But for the Indianapolis Museum of Art, which opened its "100 Acres" park on Sunday, being late to the game has played to its advantage. In search of something new, the museum abandoned its 1996 plan to create a traditional park with monumental sculptures by, say, Alexander Calder, Richard Serra and Louise Bourgeois. Instead, it commissioned works by emerging and underappreciated midcareer artists—Kendall Buster, Alfredo Jaar and Los Carpinteros, among them—and will keep most of them on view for only a few years. It will add at least one new work a year, financed by drawing from the park's $15 million operations and art endowment. And one more thing: The museum asked the artists to study the parkland and to create "site-responsive" works. Far from being a manicured lawn, the property—officially "100 Acres: The Virginia B. Fairbanks Art & Nature Park"—includes woodlands, meadows, a lake and wetlands, giving the artists plenty of potential inspirations. This being the great outdoors, then, what unites most of the original eight commissions—a broad mix of works, some more successful than others—is a sense of playfulness. Nowhere is that more on view than in "Free Basket," a colorful large-scale installation at the park's main entrance. Likely to become its signature piece—the museum wants to acquire this one for its permanent collection—the work combines basketball hoops with a tangle of bright red and blue arches that mimic the bounces of a ball ricocheting between two teams. Linking the sports-crazed culture of Indianapolis with art, the artists, Havana-based collective Los Carpinteros, have made a game both impossible to resist and impossible to play. The next piece past this entrance (there's another, closer to the museum), "Team Building (Align)," consists of two silvery rings—each 30 feet in diameter—suspended from telephone poles, which in sunlight cast ever-changing shadows on the grass below. They seem vaguely to refer to the cosmos. But there's more to the work, made by a two-man collective called Type A: At high noon on the summer solstice, the rings project perfectly aligned, concentric shadows in a metaphor for collaboration. It helps to know that Type A worked in an iterative, team-building exercise with the museum staff to create the concept. Kendall Buster has clearly taken the environmental charge to heart. Her "Stratum Pier" overlooks the park's 35-acre lake and will undoubtedly appeal to people who simply want to fish, relax in the sun or gaze at the water. They would do well to look harder. The pier is a multilayered affair, with stacked, contoured platforms descending to the lake. Ms. Buster—who studied microbiology, has a degree in medical technology and is known for her "biological architecture"—analyzed survey maps of the area and shaped the tiers to resemble a topographical map, with the edges suggesting erosion, or change. The platforms are grated, allowing visitors to see the waters below and providing a window on one aspect of the relentless process of nature. For a different view of life—and art—look across the lake at a white dome. "Indianapolis Island" is Andrea Zittel's experimental living structure, a test of self-sufficiency and individualism for the two art students (selected from 16 applications) who will call it home for the summer. The fiberglass dome includes an outdoor area with a deck and a row boat. Inside, there's a kitchen, portable toilet, and sleeping/living area. The students are taking it from there, catering to their needs with their ingenuity—using a bicycle to generate electricity, creating a water garden and fabricating furniture. They are blogging and tweeting for the public; visitors may communicate with them by placing messages in little dome-shaped vessels that will float out to the island. At times, the students may invite the public to visit—or may perform for them. The island's evolution is what intrigues Ms. Zittel. Each summer, new inhabitants will take over, using or otherwise dealing with the remains of the previous occupants as they see fit. "Park of the Laments," by Alfredo Jaar, is one of two works that sit at the serious end of the levity spectrum (the other being Tea Mäkipää's "Eden II," a dark work that references refugees and poverty). Mr. Jaar's is a meditative garden, a poetic work that called for excavating a square within a square to create a park within the park. Set among tall trees, and entered via a dark tunnel, then an ascending staircase, it feels like a world apart. When the newly planted vines grow thick, covering the limestone rocks that form its walls, it will seem even more like a refuge for reflection. For "Funky Bones," Joep van Lieshout and his Atelier created a series of white bone-shaped benches, and strung them into a giant skeleton. But his intended archaeological references to the land's previous inhabitants are likely to be lost in the fun, especially in the presence of children and around Halloween. 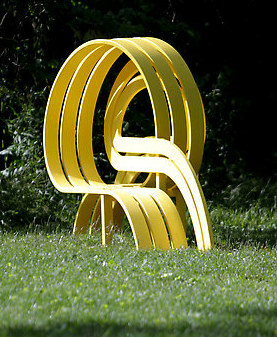 Jeppe Hein's "Bench Around the Lake" is equally engaging and more successful: He has made 15 brilliant yellow metal benches that seem to weave in and out of the park's terrain, disappearing and then reappearing yards and yards away. Each is a different shape—with curves, dips and loop-de-loops—creating a multitude of vantage points from which to view nature. They create a sense of wonder at the same time as they encourage exploration of the park. What does "100 Acres" add up to? In its inaugural manifestation, all of the works are thoughtful, though some more aesthetically interesting than others. For the most part, art and nature do walk hand and hand here. The Indianapolis museum is lucky to have such a large, varied and beautiful site as a platform. And it did well to devise a different kind of sculpture park, a relief from the tried-and true; a model in its way—but also, perhaps, sui generis.